It took automakers until the 1980s to crack the magic 200 mile per hour barrier in a production car, but hot rodders had been toying with the over-200 arena for quite a while prior. If you’ve ever wanted to get out on the salt flats and figure out what it takes to run crazy fast speeds, this is your ready-made opportunity. It’s always easier (and cheaper) to buy someone’s finished project than to build your own, and this car looks like the perfect definition of that rule. This streamliner, dubbed the “Low Sodium Racer”, is built on the bones of a 1927 Ford, but it doesn’t look like very much of that original car is still intact. It was built in 2005 by SoCal’s Vintage Hammer Garage, and was campaigned from then until last year by Kraut Bros Racing. In their hands, the car set over 20 land speed records at Bonneville and El Mirage, six of which are still current records. A five-mile run at Bonnevile saw this car reach a recorded top speed of 247 mph. A narrow beam front axle is employed, while a Ford 9" axle has been employed to handle all of the power required to move this beast to those speeds. The car has formerly been fitted with a supercharged V8, but is being auctioned without a drivetrain. 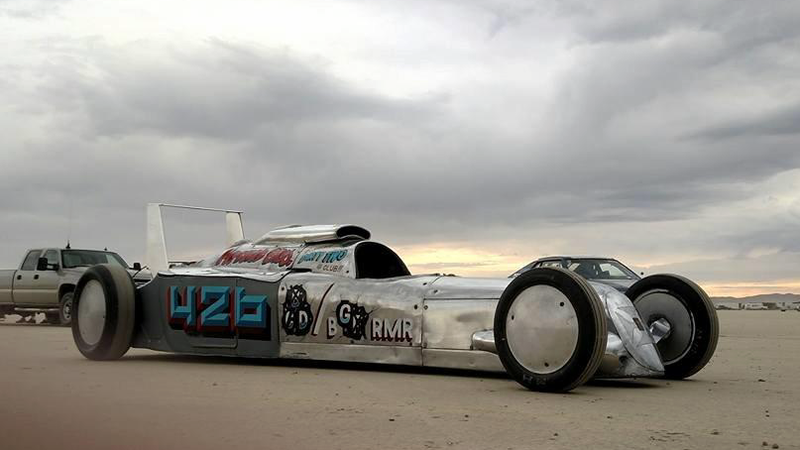 Below is a video of the car running 205 MPH in a short run at El Mirage. If you want a really good start at getting yourself into the 200 MPH club, get this beast all ate up with motor and hit the salt. Check the full listing on the Bring A Trailer site for more information and photographs.